Some people love to cook with beer. It can add an interesting flavor twist to a variety of foods and there is a range of innovative recipes that use beer as an ingredient. If you are looking for recipes that use beer, then you are bound to come across several recipes for beer can chicken. 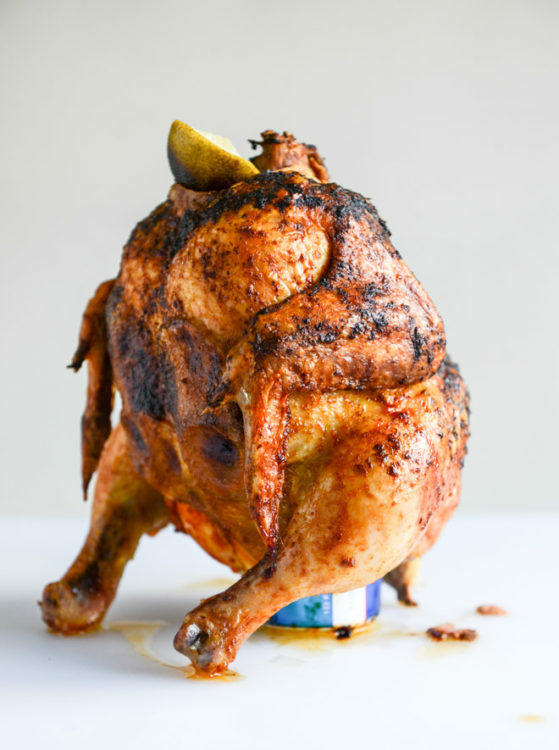 With beer can chicken recipes, you have an interesting way to roast a chicken that uses the can as a stand and the steam from the beer to add some flavoring to the meat. To make beer can chicken it can help to have some special equipment just for the task. You are going to find that there are plenty of people that like to make their beer can chicken without the use of any special holder. Essentially, they use the can and the legs to balance the bird while it is cooking. While this method may work, it can be problematic. Firstly, the chicken won’t always balance well without the holder. If the bird falls over when it is cooking, it can be pretty difficult to set it right and it could expose you to the possibility of getting burned. In addition to that, if it falls, all of the beer will spill. Then you also have the issue of removing the beer can chicken from the grill. It can be kind of tricky when you do not have the holders, so it just makes things easier when you use the right equipment. 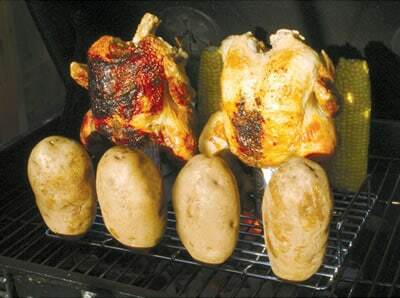 The basic beer can chicken holder is under $10 and does the job of stabilizing the chicken on the grill. 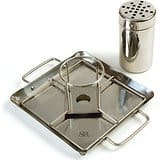 You can also find a holder with a drip pan to keep the juices from flaring up the fire. Lastly, you have the option of a double holder, and we found one that has skewers built in to hold corn on the cob and baked potatoes, too! As mentioned above, the beer does help to add some flavor to the chicken, but it is not really going to be enough on its own. When you go to cook your own beer can chicken, you are going to want to use a nice rub that will play well with the flavor of the beer. A rub that is a little on the spicy side will work great for beer can chicken. It does not even have to be a rub that is specifically for beer can chicken. The main thing to consider is the way that the beer will work with the flavors of the rub. A simple rub with common household spices should work perfectly. If you are looking for some beer can chicken rubs, then you can try this rub for a nice mix of sweet and spicy. Additionally, there are several on a blog that is dedicated to the practice of cooking beer can chicken. One of our favorites is the mustard dry rub from the Beer Can Chicken Blog. If you want to cook beer can chicken, then you have a variety of methods to choose from. Cooking on the grill tends to be one of the most popular options, but there are recipes that will allow you to make beer can chicken in the oven. This can be a particularly good option for making beer can chicken when the weather will not permit cooking on the grill. With many of the beer can chicken recipes that you will find, they use the same types of rubs that you would use on the grill, but the only difference is that you roast the bird in the oven. This option from BetterRecipes is a nice way to make beer can chicken in the oven and it turns out nice juicy on the inside with a good crisp skin. For some people, a simple beer can recipe will also work well to allow for a more natural roasted flavor. Cooking beer can chicken on the grill is going to take a little more effort and a little more skill, but the reward is that it tends to provide a much better end product. In general, you are going to want to cook the chicken over a high indirect heat and this is where special equipment like the holders and a grill thermometer can really come in handy. A good beer can chicken off the grill will come away with a nice smoky flavor in addition to the flavor of the rub that you use. In addition to that, the grilling method tends to offer a crispier skin and meat that is just better. With the smokiness, it also opens up a range of additional flavors that will work well with the chicken. A good maple-chili rub can work perfectly for your next attempt at beer can chicken. The combination of sweet and spicy will play well with the beer and the smokiness will provide the perfect flavor to top it all off. However, you could try something that is a more simple recipe for beer can chicken on the grill and just enjoy the nice smoky flavor of the meat. Using a smoker will be another great way to make some beer can chicken. Making smoked beer can chicken is probably going to be a little more time intensive than cooking it on the grill, but it is great if you want an extra smoky flavor. In addition to that, the smoker will make for meat that is much juicier. You can smoke the chicken the old-fashioned way, but you do also have the option of using an electric smoker, which can make the job a little easier. Another benefit to the smoker is that you can buy different types of wood for different smoking flavors. The one issue is that cooking at the lower temperature, it may impede the ability of the beer to create a steam, and therefore, you get less of the additional flavor. If you want a nice zesty beer can chicken that has an awesome smoky flavor, we found a good one at Four Square Recipes. With beer can chicken, you get a fun and interesting way to roast a whole chicken. It works well for making a nice, fully cooked bird that will produce meat that is juicy and tender. For many people, once they try beer can chicken, it becomes their favorite method for roasting and they will develop several recipes for adding their own touch to it.